Notes: Based on a novel by Tomihiko Morimi, published by Gentosha. After their father's untimely death some years ago, the Shimogamo family have taken to the tragedy in various ways. Yajirou has exiled himself to a well after turning himself into a frog, while Yaichirou decided to follow in his father's footsteps by becoming the leader of the Tanuki society. Yasaburo have chosen more of a middle road, spending his days wandering around the city, perfecting his transformation abilities and taking care of an elderly tengu by the name of Akadama after the latter threw out his back. But there is darkness hiding beneath the tanuki society, and the Shimogamo family might learn more than they cared to know about the circumstances around their father's death. 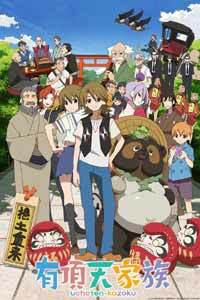 It's hard to really "peg" The Eccentric Family, because it's quite frankly unlike most other shows I've seen. The closest that comes to mind is either Natsume's Book of Friends or Gingitsune, mostly because the two shows blend mythology with everyday drama as if it was the most natural thing in the world. But unlike the two aforementioned, where mythology is kept separately from the human world by a barrier of sorts, in The Eccentric Family, the two blend together like a hand in a glove. As mentioned in the synopsis, Yasaburo is a tanuki. His heritage aside, both he and two of his brothers spend most of the time onscreen in human form, which is how they meld into human society. Most of the tanuki do this, in fact, though it is debatable just how much the human part of the population is aware of this. For many, it is a necessity, but Yasaburo tends to treat it as a lark, a way to pass time as it were. The danger, and the biggest curiosity, seems to be the club called "The Friday Fellows", a group of humans who go on social gatherings to eat and be entertained. The problem, especially for the tanuki themselves, is that the Friday Fellow's new year's special is tanuki hot pot, which, incidentally, is how the head of the Shimogamo family met its untimely end. Despite the dark aspect to it, The Eccentric Family is anything but. Sure, it has its serious moments, but there is a informal tone to everything in the show that makes it so much fun to watch. Yasaboru proudly touts what is referred to in the show as the "idiot blood", a term for the heritage brought onboard by his father and the go-to excuse when the chips are down and things are about to get ridiculous. The constant feuds with the Ebisugawa family, for whom Yasaburo and his brothers have an uncle, are all hilarious and usually come with various supernatural items spicing things up, like a small temple/house/...thing... that runs on alcohol, and a fan that can whip up a mean (and very local) storm wind. The tengu aspects old man Akadama brings to the equation can also be felt within the character of Benten, a woman who, as a girl, was kidnapped and brought up by Akadama. She was taught many of the powers and abilities of the tengu, so when she grew up, she left Akadama and later joined the Friday Fellows. Benten is a frightening woman; icy and cool in demeanor, as well as mischievous and powerful. She takes a bit of an interest in Yasaburo, but not so strong that she'd let the opportunity to join the Friday Fellows pass her by when it presented itself. This weird disconnect is what makes The Eccentric Family so fascinating. Though his connection with Akadama, Yasaburo eventually meets another middle-aged man who wishes to join the Friday Fellows, and, as such, is tasked with providing the next new year's meal. He and Yasaburo has a long, absurd conversation about how eating is love, even though he knew Yasaburo was a tanuki. In fact, the tanuki themselves seems to take the whole thing bizarrely well; nobody ever holds any grudges against the Friday Fellows, least of all the Shimogamo's, but that doesn't mean they won't raise hell over high water if one of theirs are about to meet a delicious end. It also helps that the visuals are great. The characters might look a bit simple, but I really like the show's somewhat unusual style, and the animation in general is pretty damn good. The show is particularly delightful when things get hectic. There is a sequence where most of the Shimogamos are partying in the aforementioned small house room that flies in the air. While there, they meet the Ebisugawas, and things devolve into a huge battle with fireworks that is a feast to the eyes and the funnybone. It's not often you get something so utterly chaotic and surrealistic, yet placed in a setting of realism in the way done here. Spirits and folklore are more often than not the spice to an everyday setting, so when The Eccentric Family just mashes everything up into a gooey meatball and slams it into the frying pan, you know you just gotta slap on that bib and prepare for a feast. Recommended Audience: The show is fairly light in actual violence, where most of it is of the slapstick kind. Fanservice is just about nonexistent. However, the show still portrays some darker stuff, like the possibility of our main characters being captured and cooked as a meal. Plus, there's something rotten going on in the world of politics too. The Eccentric Family © 2013 P.A. Works, Uchōten Kazoku Production Committee.